Early Wednesday morning, November 29, 2017, a busload of Adair County students departed for the Regional Student Technology Leadership Program (STLP) competition at the Center for Rural Development in Somerset, KY. For the second year in a row, a team of students from each school went to present their technology project in hopes that it would be deemed worthy of advancing to state competition. Students from school districts located throughout south-central Kentucky participated in the event. All projects were judged by a rubric that included categories on learning applications, project design, and presentation with a minimum score of 85 required to advance to State competition that will be held at Rupp Arena on March 29, 2017. At the end of the day, the entire Adair County team felt that the day was a success and left feeling proud of the work the students had done. There was a lot of interest in and praise for all of our projects with a steady stream of visitors, including students and teachers from other school districts and Kentucky Department of Education staff. At Adair County Primary Center, the motto is “ACPC where little kids do big things” and a team of second grade students certainly proved that with their project, “Bus Safety for Everyone”. The students created a bus safety video that is available for the school district’s use. The students not only starred in the video, but also researched, recorded, and edited the video. Students plan to continue the project by creating other related activities for teachers to use along with the video including an instructional game, craft, worksheet, song, coloring page, and a test. ACPC STLP Coordinator, Laura Marcum, comments “I truly enjoy going to the showcase and listening to the kids talk about their project. It is really cool that the group is made up of second graders.” Students that participated from ACPC include Claire Loy, Ashley Loy, Addy McMinoway, Sallie Ballou, Carter Curry, and Trenton Stayton. The “Doggie Dash”, Adair County Elementary School’s project, was held on October 21, 2017 and presented at regional competition. The ACES STLP students hosted a fun run/walk for community members and their pets. The purpose was to raise money and collect donations of food and supplies for the Green River Animal Shelter. Students planned the project from start to finish and analyzed data using various technology tools. Student photographers, videographers, and reporters were onsite to capture the event while additional students staffed water stations for participants. The students designed “Doggie Dash” t-shirts that were sold. This impressive project included technology, leadership, physical fitness, and entrepreneurial skills plus community involvement. 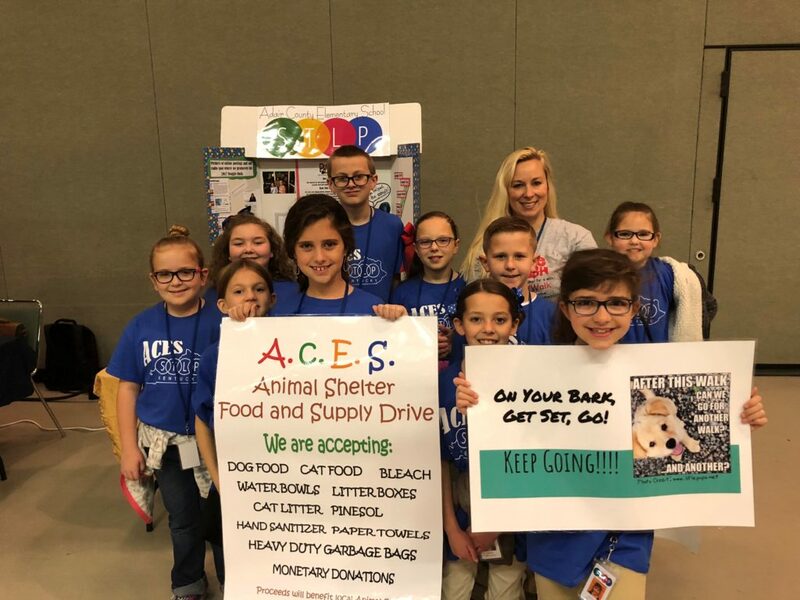 Robin Hancock, ACES STLP Coordinator, says “Our Adair County Elementary STLP students have been dedicated to the Doggie Dash project since day one. Their commitment and hard work is awesome.” ACES participants included Addie Baker, Samantha Oliver, Lilly Myers, Sofia Coleman, Brady Karnes, Alayna Marcum, Natalie Sneed, Jack Fishback, Remington Huckaby, and Lydia St. Andrew. Brent Moore worked on the project, but was unable to attend. 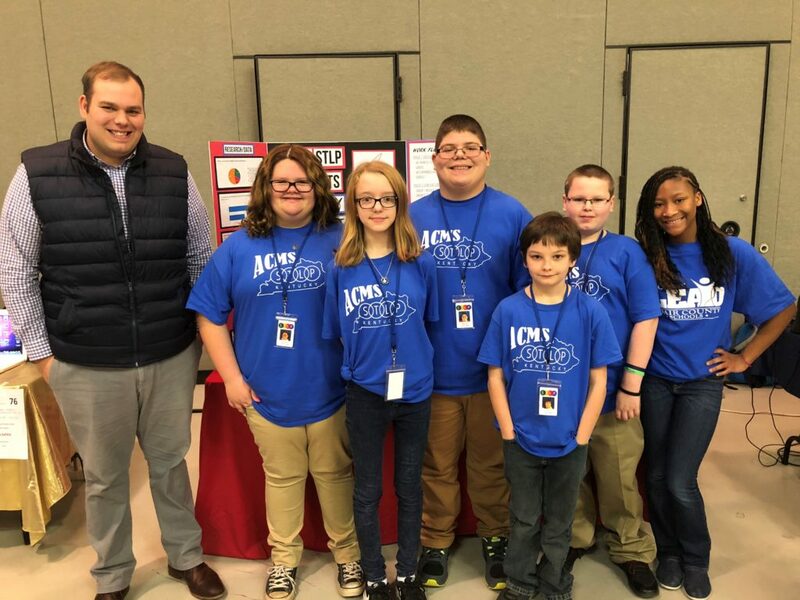 Adair County Middle School’s STLP students saw the need for additional technology support at their school and chose to create and showcase the “Indian Tech Help” project. The students utilized Google Sites to create a website that includes tutorial videos and other resources—all created by students—to provide students and staff with technology support and resources. With an outstanding start to their project, the students plan to continue to add resources to the website and market it to others. Adam Cox, ACMS STLP Coordinator, says “I’m really excited for my STLP students today. They have worked very hard for this moment and are already super excited about expanding and polishing their project for state. I really look forward to seeing their project grow and become state-ready. Good job!” Students that participated from ACMS include Kailey Roberts, Alexis Conover, Malakai Horton, Connor Lynn, Chad Wiley, and Mayatu Brown. 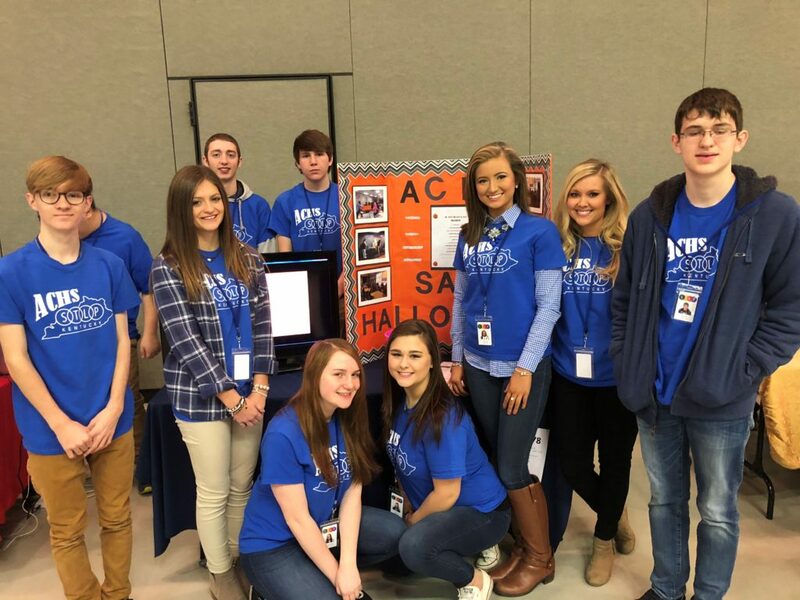 Adair County High School’s project, a “Safe Halloween” PSA, involved high school STLP students utilizing technology tools, including video production and visiting Adair County Elementary School classrooms to provide Halloween safety instruction for those students. ACHS students gained technology and leadership skills while ACES student learned about Halloween safety. The impressive project was rewarding for all students involved. According to Katie Curry, ACHS STLP Coordinator, plans are to make the project an overall safety initiative. While the students will continue to improve the Safe Halloween PSA for annual use, they will also create a Safe Prom PSA for the Spring. Students plan to survey district staff to determine additional safety issues that might need to be addressed. She adds “The students are very excited to be a part of this and to feel like they are doing something that can actually make a difference.” ACHS participants include CJ Bonifer, Emily Wall, Stephanie Roszak, Makayla Burton, Morgan Harvey, Alex Godsey, Tristan Coomer, and Riley Robertson. Easton Downs worked on the project, but was unable to attend. According to the STLP website (http://stlp.education.ky.gov), The Kentucky Department of Education’s Student Technology Leadership Program (STLP) uses project-based learning principles to empower student learning and achievement through the utilization (and creation) of technology to solve school and community needs. STLP provides a means for student to design, make, connect and learn. All schools in Adair County have active STLP organizations and all students are welcome. Any student who is interested in joining should contact the STLP Coordinator at his/her school. Pictured (Left to Right) in the front row are Addie Baker, Samantha Oliver, Lilly Myers, Sofia Coleman, Brody Karnes, and Alayna Marcum and in the back row are Natalie Sneed, Jack Fishback, Remington Huckaby, Robin Hancock, STLP Coordinator, and Lydia St. Andrew. The Center for Rural Development, 2292 South Highway 27, Somerset, KY. Photo by Jason Rector. Pictured (Left to Right) are Adam Cox, STLP Coordinator, Kailey Roberts, Alexis Conover, Malakai Horton, Connor Lynn, Chad Wiley, and Mayatu Brown. The Center for Rural Development, 2292 South Highway 27, Somerset, KY. Photo by Jason Rector. Pictured (Left to Right) in the front row are CJ Bonifer, Emily Wall, Stephanie Roszak, Makayla Burton, Morgan Harvey, Katie Curry, STLP Coordinator, and Alex Godsey and in the back row are Tristan Coomer and Riley Robertson. The Center for Rural Development, 2292 South Highway 27, Somerset, KY. Photo by Jason Rector.